Last year, I started the Dutch Rose CAL (https://www.ravelry.com/patterns/library/dutch-rose). I love the look of this blanket. 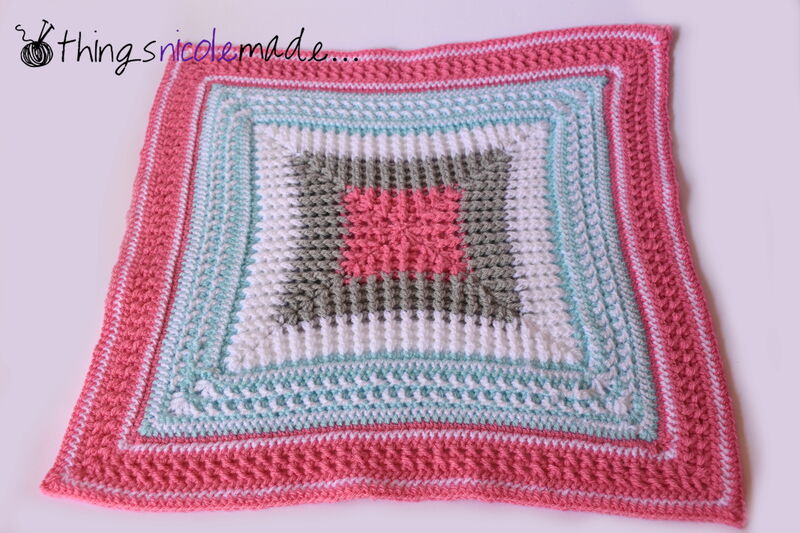 It combines the old fashioned look of granny squares in a new, more modern way and also incorporates the rose pattern. 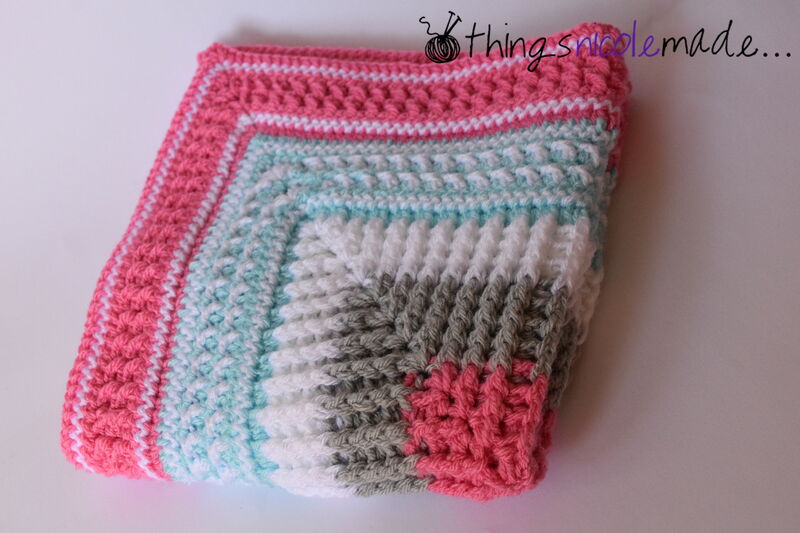 I loved the colours that the designer, Rachele Carmona, used for her blanket, but, at the same time, I wanted this to be a stash buster for me (I need to bust my stash just a little!). I managed to find equivalent colours in my stash for all but one colour, a dusky lavender. I set out to find this colour, and found the perfect one in Spotlight. Sadly, it was 100% wool, compared to acrylic for the rest but it was the only colour I could find like it. “What’s the harm in combining the two fibres?” I asked myself and started crocheting. 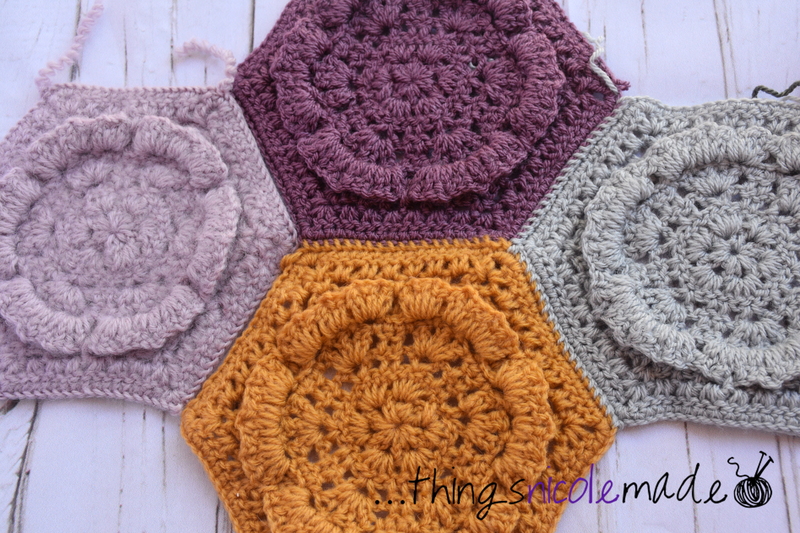 Once I had made all of the hexagon motifs, I whip stitched them together (a new technique to learn that I love the finished look of but it takes oh so long!) and decided to give it all a bit of a wash and block. I’m so glad I did! I am the mother of two small children. I learned long ago that if it can’t go in the washing machine, it’s not worth having. Of course, when I wash my crochet items, I use the wool cycle with the appropriate detergent and I have never had a problem until now. When I pulled it out of the machine and laid it out, most of the squares looked beautiful, with great stitch definition etc. But my poor lavender squares were somewhat felted! I hoped that once they had dried, they would lose their fuzziness, but, alas that was not to be. Sitting next to the beautifully defined ones, these looked awful (to me anyway!). So, being the perfectionist I am, I decided that I wanted to pull these hexagons out and replace them. 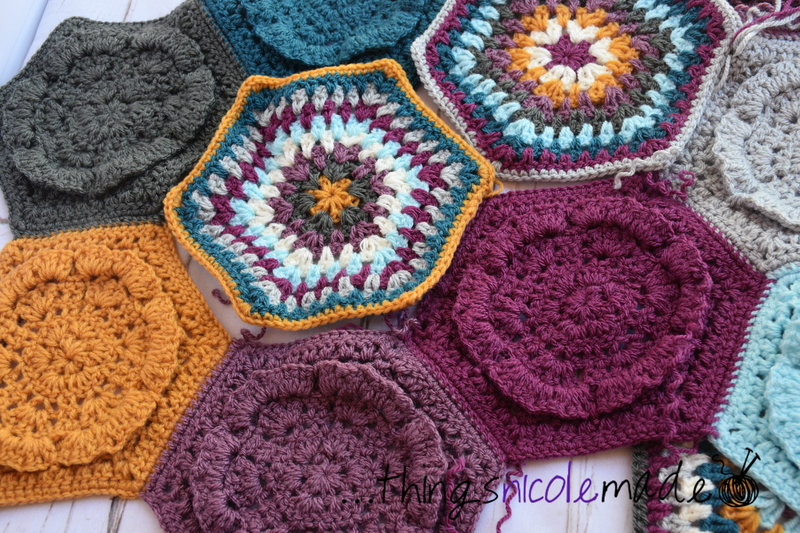 It also meant pulling apart a bunch of the granny square hexagons as well to remove the offending rows. I thought doing it now before it is all finished would be less painful than waiting to see if I could get away with it and finding out I couldn’t! 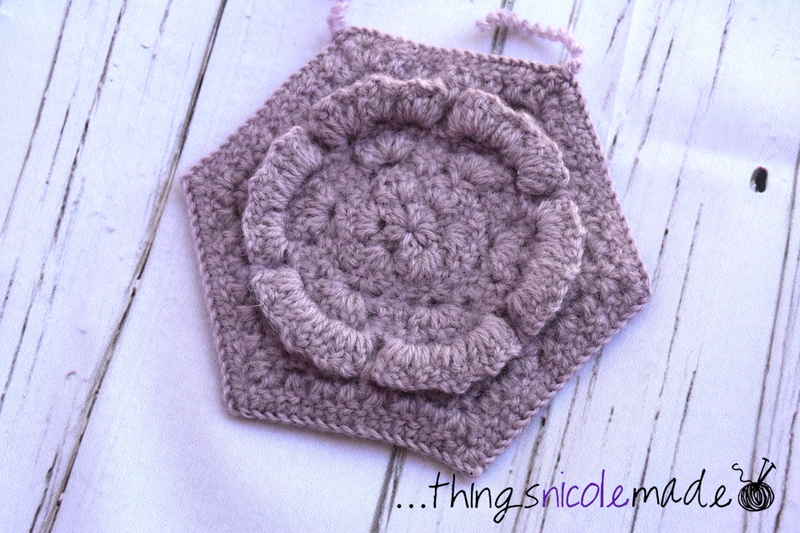 The granny squares have been redone, but I have yet to replace the offending rose hexagons. I need a moment where I can sit down and look at what is there and what colours I should replace them with so it all still looks harmonious. So, my lesson has been learned. There are legitimate reasons for not mixing different fibres in the same project (of course unless there is a reason to want them to look different). I learned it the hard way, but if I can help someone learn it the easy way by not having something go wrong in the first place then it has been worth my time. I will continue to work on this blanket and hope to post a finished version later this year! I was talking to a friend the other day and saying that I am having trouble finding projects for my blog at the moment! It’s not that I’m not working on things – I am. And it’s not that I’m not finishing things – I am. The trouble is that I am busily working on my entries for the Gawler show, and don’t want to post completed photos until judging has been completed. However, the show is in just two weeks time, and lots of other exciting things are happening yarn wise for me soon, so there will be plenty of content for my blog soon. In the meantime, I am still working busily on things. I started a few weeks ago a 5 day cal through Sewrella (http://www.sewrella.com/2017/07/5-day-mystery-cal-materials-list.html). As you are aware, I have done a number of cals over the last few years. Some are completed, some are finished and waiting for construction and some are still not finished. I liked the idea of a quick, 5 day cal – seemed quite manageable. I also love a good mystery cal (although find it so frustrating to not know what colours to choose!). After the first couple of days, I knew we were making a bunting. And this is where I get proud of myself. I am not really a bunting kind of person. I occasionally use it as a party decoration, but my house is not bedecked in it. 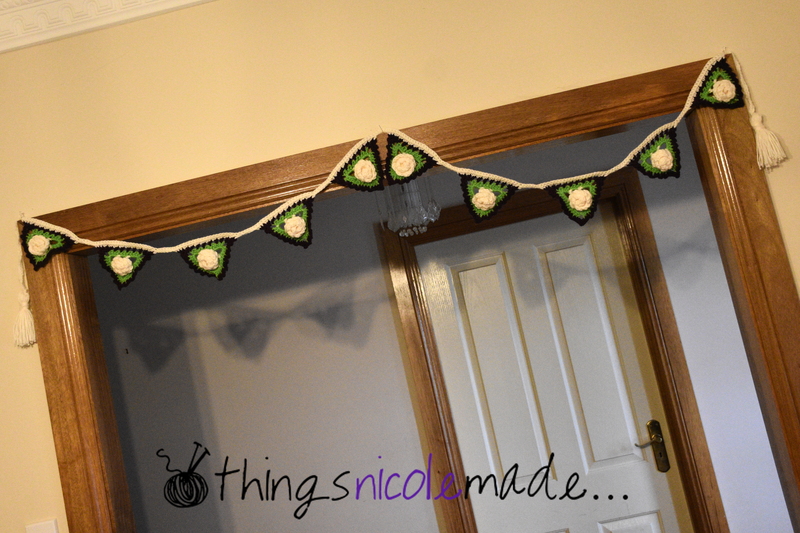 So, after finding out that I was definitely making bunting, I was tempted to stop the project. But, I knew it was only a commitment of a couple of days to complete the project, so I stuck at it. I love the design and the little roses in the centres and am quite happy with the finished product (even if I don’t know what to do with it! My youngest daughter did just wander in the lounge room where is was hung to take the photos and say “Mum, I really like what you’ve done in here with this”, so maybe it can stay for a little while!). I especially love the big, fat, tassels! It was exciting also in that it called for Worsted Weight yarn. Any Australians will know that that equates to about a 10ply here and that it is almost impossible to get your hands on 10ply yarn in Australia (8 or 12py are the usual options). I had a friend who had recently been on a trip to Canada, and I asked her to pick up some Red Heart Super Saver yarn. I hear about it all over the internet, but it is not something I can easily get my hands on here. She managed to squeeze a few balls into her case for me, and it was with great excitement that I was able to use them on this project (the green and the purple)! So, this is my first foray into the world of bunting. 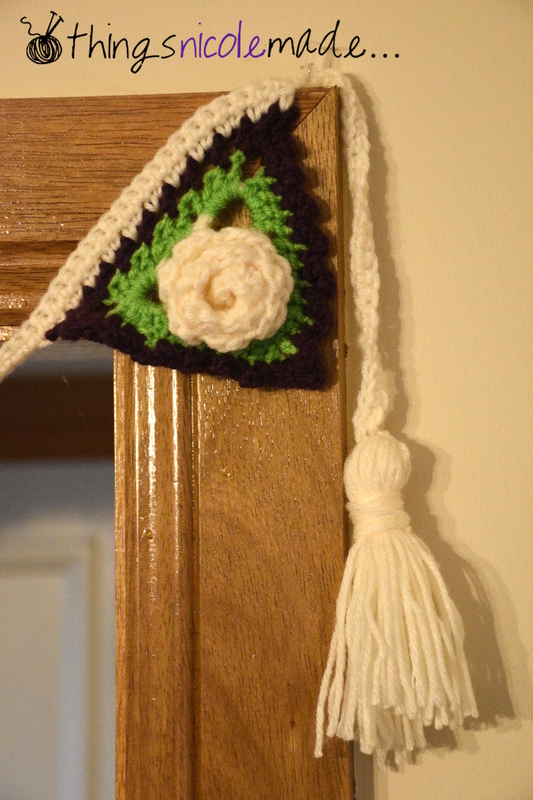 It is a quick, easy project to do, and I love the fact that the 5 days included total completion. It really still needs blocking, but I’ll leave it to hang a few days and see how it goes! To block or not to block….. 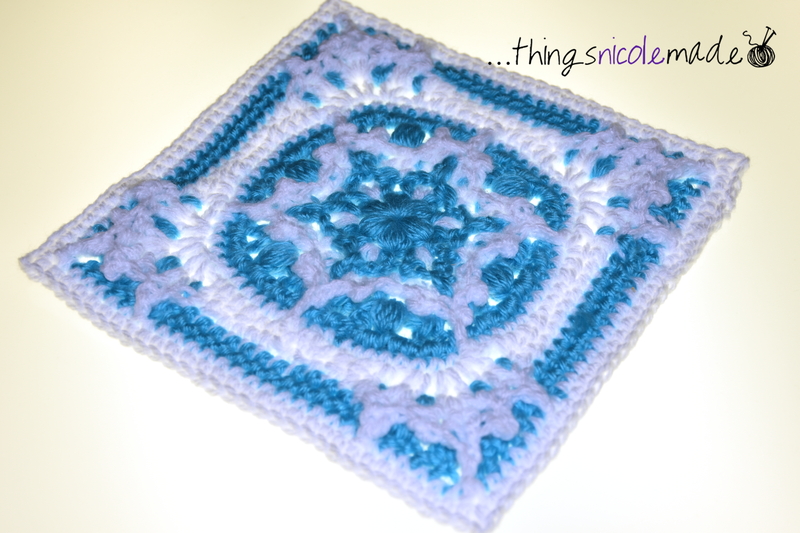 Blocking – I hate it! And I love it! It makes it take that much longer to finish a project I have been working on but the results are worth the time. What is blocking you may ask? It is the process of relaxing the yarn to correct any areas that may have come out of shape during the crocheting process. I have been crocheting for many years but have only come across this concept in the last year or two and it is revolutionising how my finished pieces look! 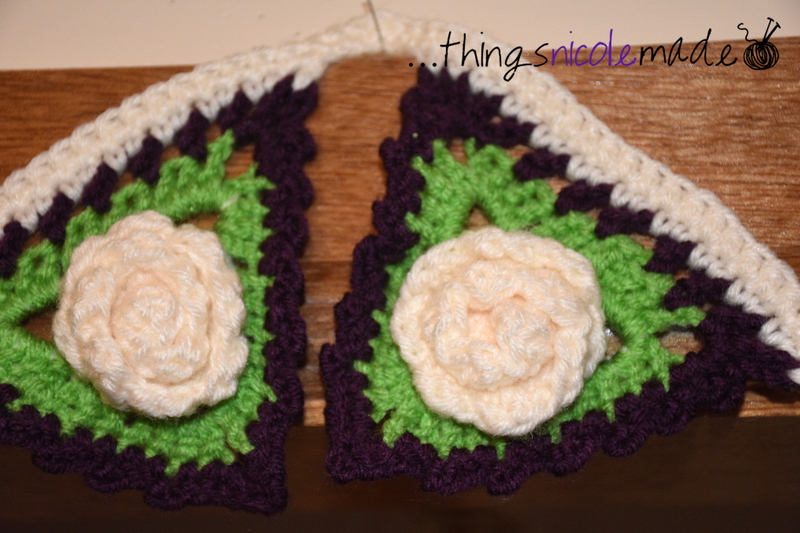 There are a number of ways to block a crochet piece (googling it brings up many options) but the way I have settled on doing it is as follows. I pin the item out in it’s correct shape on a foam camping mat (bought at Aldi but you can also get kids alphabet sets at Kmart that work just as well, they’re just smaller!) and then I spray, spray, spray it with a spray bottle of tap water. I press down on it to make sure the water has penetrated the piece, then I leave it for a day or two depending on the weather and voila! Remove the pins and you’re done. If the piece is really wonky or very large, I would probably put it through the washing machine first and then pin it out to dry. My husband has bought me a wonderful big blocking table (hang on, I can hear him saying something about it’s meant to be a pool table for him to use! ), so I leave my blocked pieces on that to dry. It’s an ideal surface for me to use because it is high and as I am a tall person, it is easier on my back bending over to pin everything precisely. You can leave your mats on the floor for the piece to dry but with two children and two cats (who would think it was the perfect place to sleep! ), I prefer to keep it up off the floor! Once your piece is dry, you WILL notice a difference. It has a neater, more professional look with crisper edges and corners. Much as I hate doing it, the end result makes me happy. 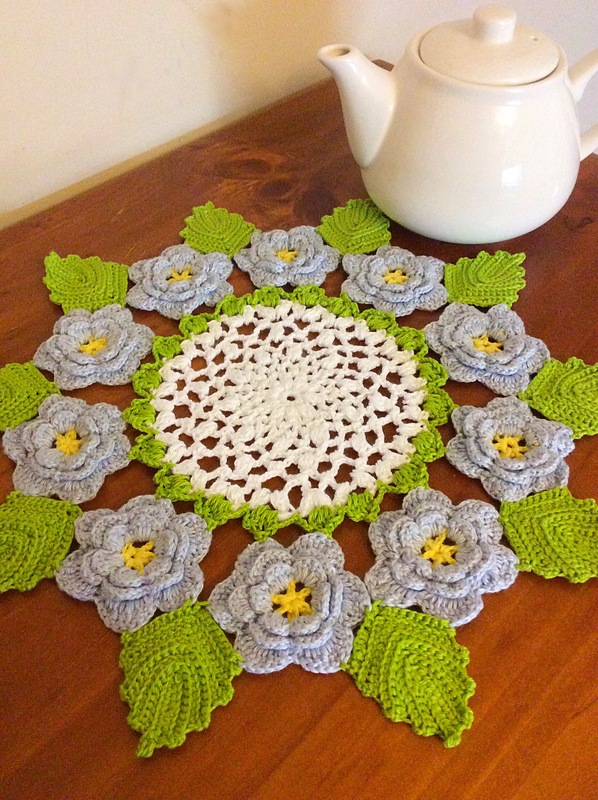 Last year, I entered a doily in a local show. When I was collecting my pieces, a lady actually asked me if I had blocked the doily because she could tell there was a difference. This was very encouraging because I had put a lot of work into blocking it and didn’t think anyone would appreciate the difference. It has encouraged me to keep going with it! 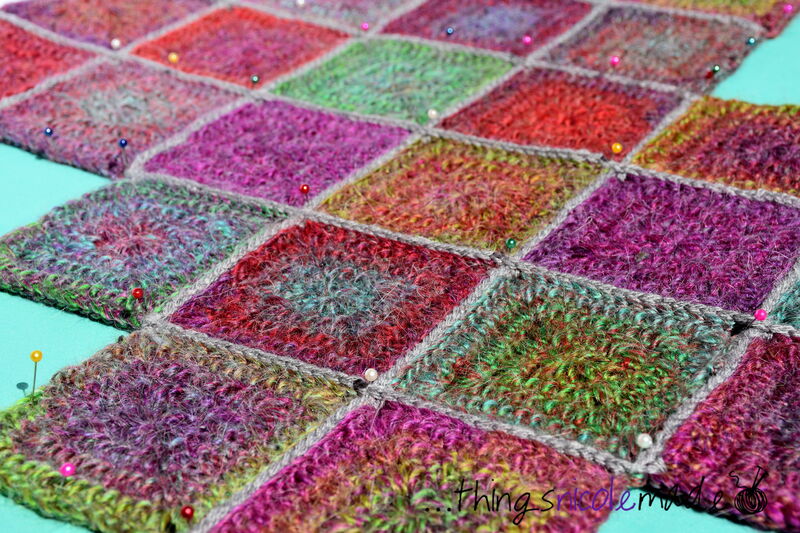 I have just completed the main section of a bag (keep your eyes open, it will be appearing on the blog soon). 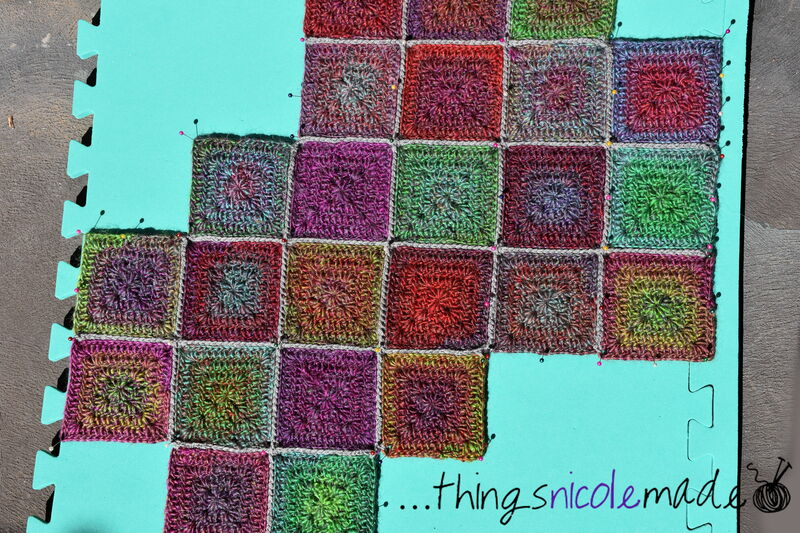 I had the usual talk to myself – “does it need blocking? It’s pretty much in shape, the squares are a little “bubbled out” but I suppose it doesn’t matter because it’s a bag, not clothing, etc”. However, I decided to bite the bullet and block it and I am so much happier with how it looks now. I don’t have a before picture, but here it is blocking away nicely! So, I thought, here I am rambling on about blocking and the benefits of it and so on, but you really need to be able to see a before and after shot to get a good idea of what blocking will actually do. And, I have the perfect project to demonstrate it on for you! I have been busily working on the Neave Collection Blanket https://www.facebook.com/groups/621056114767998/?ref=bookmarks. 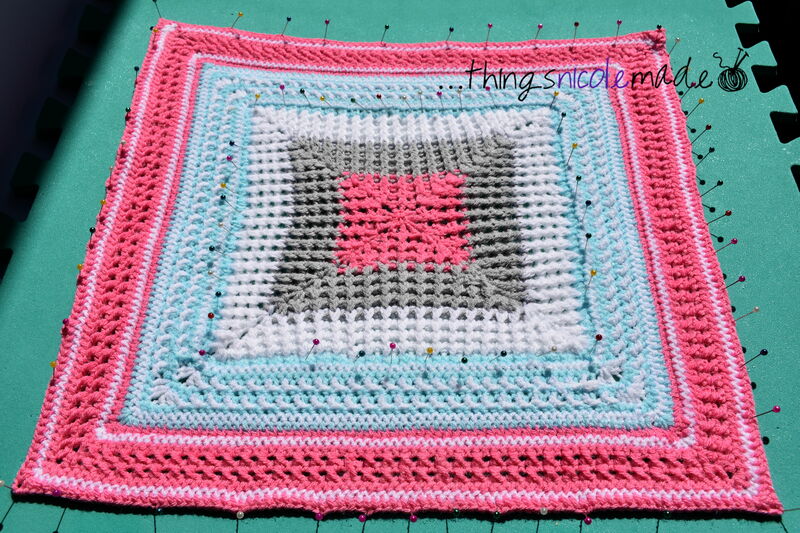 The centre square begins with a series of front and back post stitches and then evens out into a lot of half double crochets and single crochets. Due to the front and back posts, it tends to buckle. Although it has flattened out a little as I’ve gone on, it is still pretty wavy. I have been holding my breath because a lot of people have had the same problem, and it has been corrected with a block. So, I am up to the part of the pattern where it is suggested that I block the piece, so block it I have and it has made a huge difference.It’s not perfect by any means but it sits flat now and gives me hope that as I continue to crochet around it, it will correct itself even more. I am so excited to finish it and gift it to my friend! Neave blanket centre square unblocked….. I can even fold it up nicely now! So, now you have read about the benefits of blocking, go and give it a try. You can buy all sorts of fancy wooden blocking boards (I’d love to get some one day!) and pins, you can make your own wooden ones, or you can use foam boards like me but I guarantee you, it will make a huge difference to the finished presentation of your crochet! It’s been a hot few days in little ‘ol Adelaide. Great for drying the washing, however you need to wear your thongs (flip flops) whilst at the washing line to avoid burning your feet on the concrete! To think of cooler things, I thought I would share this gorgeous square I have recently completed. It’s called Blizzard Warning! by Polly Plum and you can find the pattern over on her blog http://everytrickonthehook.com/2015/11/05/blizzard-warning/. Although it looks very intricate and tricky, the pattern was easy to follow and has made up so beautifully that I’m trying to think of where to use it. 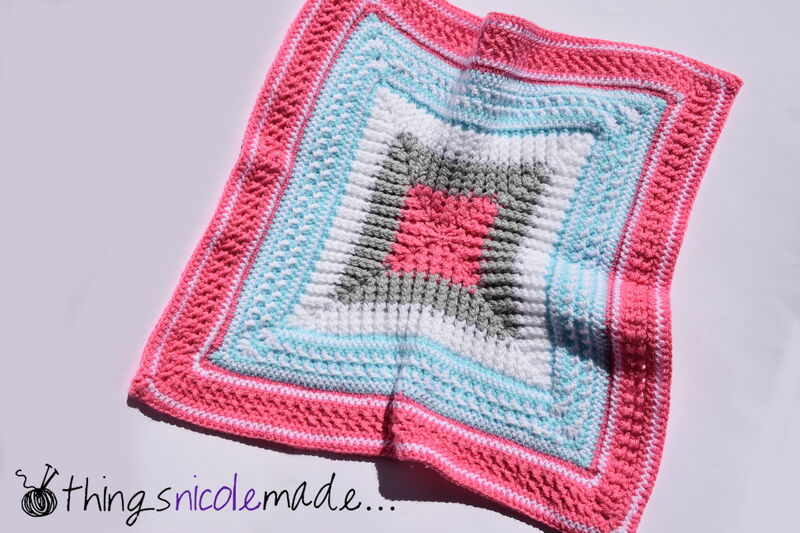 Making more for a blanket maybe….. I’m sure one of my little “Frozen” fans would think a blanket made from this is the bees knees!